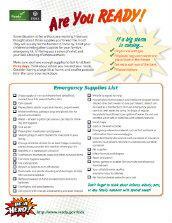 This package of materials assists adults and their children to prepare for disasters, containing a family communication plan and emergency kit checklist. It aims to empower children and teenagers with knowledge about safety in emergencies and be part of the process for family disaster preparedness. Number of pages/running time 6 p.